After a difficult winter, Boston is preparing early. 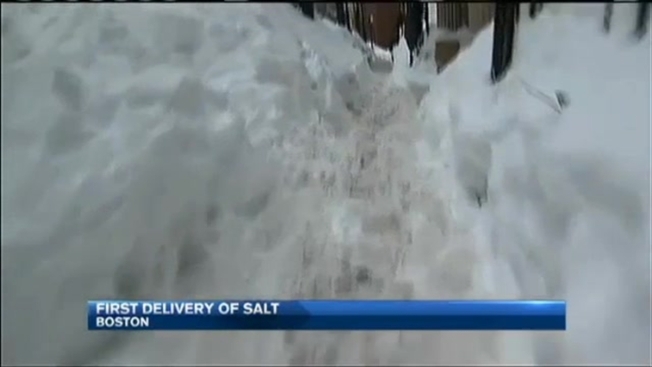 The city has already received a shipment of 3,000 tons of salt. The piles of that salt can now be seen at the Boston Department of Public Works site on Frontage Road. It's a tough thought for many, with fall upon us, and summer now just a memory. "It makes me want to cry," said one commuter. "I think it's really depressing," said another. "Labor Day just happened." City officials say by the end of next week, they hope to have an additional shipment for a total of 12,000 tons of salt. Last winter was Boston's snowiest winter ever. Cars were buried, walkways were impassable, MBTA trains came to a standstill, and frustrations were high. Danny Nee is a Boston public works supervisor and says last year was one of the most challenging, and the workers spent non stop hours on the clock trying to clear all the snow. The infamous gigantic Boston snow pile also only melted in July, leaving behind mounds of trash.